See the newest features in our B9Create software driven by your feedback: Queue and Surface Finish, responding to the market’s desire for improved surface finish and the ability to more efficiently manage printing workflow in high-volume applications better than ever before. Designed for the B9 Core Series, use our new Surface Finish feature for when a flawless finish is a must – perfect for making master molds or unique pieces requiring superior smoothness. Driven by user feedback, the new Surface Finish software feature augments the exceptional print speed and crisp detail of the B9 Core Series with remarkable smoothness that reduces post-processing time. Ideal for when a flawless finish is a must, Surface Finish was designed for making master molds or unique pieces requiring a superior finish. “We are always listening to and leveraging customer feedback to drive product developments. Customers asked for a more efficient way to manage their digital workflow and to optimize for surface finish on models requiring a flawless finish. We transformed that feedback into technology with the launch of Surface Finish and Queue,” said Shon Anderson, B9Creations CEO. How does Surface Finish work? To understand the benefit of our new Surface Finish feature, it helps to first understand the technology powering your prints. Digital Light Processing (DLP) technology used by the B9 Core Series offers a significantly faster and higher resolution alternative to Stereolithography (SLA) technology. SLA traces each layer of a model individually, in essence outlining the shape first, then tracing each layer until the middle section is filled in. The more models on your build table, the longer the print time. 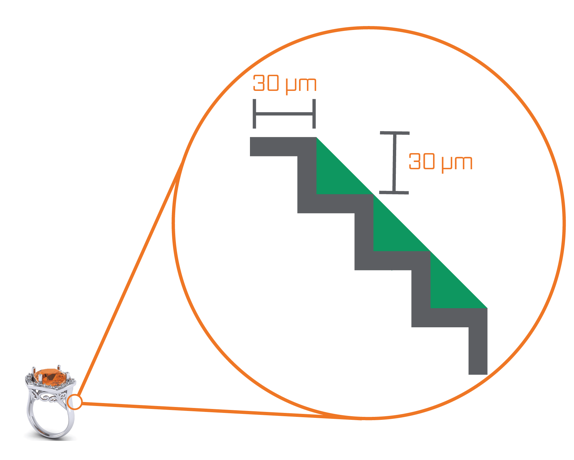 Additionally, the detail in the XY axis is dependent upon the size of the laser, which can be as high as 140 microns. However, the lower resolution or muted detail offer prints with better surface finish. Conversely, DLP technology uses a high-definition light engine to flash a complete layer at a single time at a resolution of 30 microns (a third the thickness of a human hair!) in the XY axis. Because that projector delivers light in pixels at a high resolution, detail is visible, including grow lines on the models. Our new Surface Finish feature smooths the edges of your print, reducing those grow lines – and your post-processing time along with it. 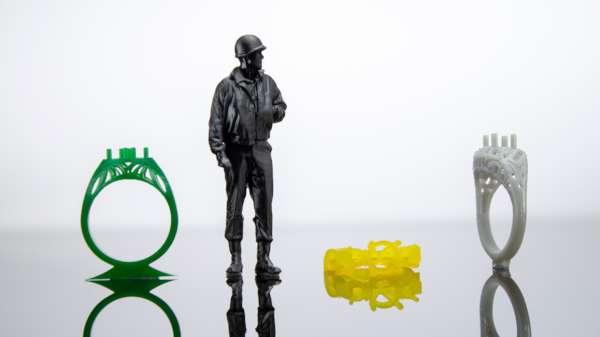 Whether you're making master's for model making, need a flawless finish for a custom ring, or are concerned about grow lines affecting fluid dynamics in your prototyped part, Surface Finish offers superior smoothness with the same print speed and resolution you've come to except. What features does Queue offer? The Queue feature in B9Create makes managing high-volume production easy, offering customers an intuitive way to optimize their workday no matter how many models, machines or team members are involved. Our software now enables separation of process management and scheduling from the act of printing. Shop Floor or Production Managers can prioritize workflow and leave the printing to technician due the speed and simplicity of the Core Series platform, powered by B9Create, B9Creations free software package. The new firmware update also includes improved supports closer to build table, Tiny Supports added as a default support type, and "Front" and "Back" text added to the build table. Both features are available in B9Creations free software, B9Create, available for download here. Want a walk-through of our B9Create software to see its latest features and learn how to import, support, and slice your models?